It all kicked off July 14th when a number of Disney characters turned up for Family Night at the Hollywood Bowl and the first Winnie the Pooh for President convention. Gathered in front of a crowd of 10,000, Disney characters—including Snow White and the Seven Dwarfs, Mickey and Minnie Mouse, the Three Little Pigs, Peter Pan, and Mary Poppins—were joined by comedian and emcee Morey Amsterdam, and the Hollywood Bowl Orchestra and Disneyland’s Kids of the Kingdom provided musical entertainment. A local ice company provided 20 tons of ground-up ice for snowman building and snowball fights. 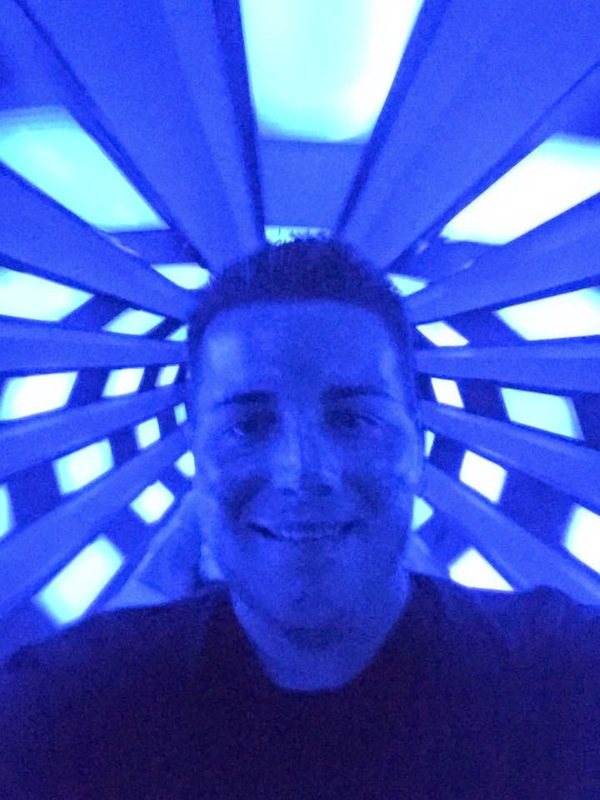 It was a night that would go down in history and the start of one of Disney’s most unique publicity campaigns. 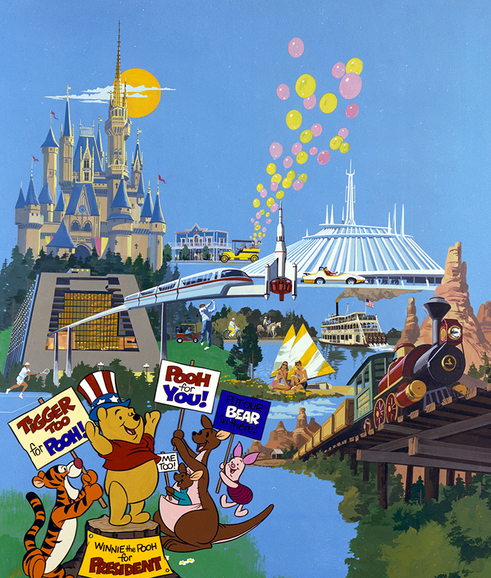 Building on the success of the rally, Pooh moved his campaign to Disneyland where, at the Tomorrowland Stage, his “musical political convention” became part of the “On Stage U.S.A.” show. 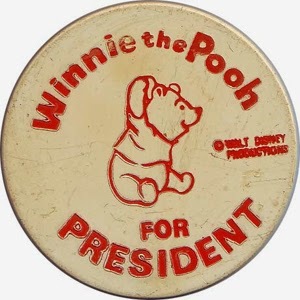 Throughout August, “Winnie the Pooh for President” was performed twice a day alongside such celebrities as Shari Lewis and songstress Peggy Lee. Pooh lost the 1968 campaign, although Democratic candidate Hubert Humphrey admitted that the bear made more sense than “any other candidate.” It wasn’t the “silly old bear’s” last brush with politics, though. 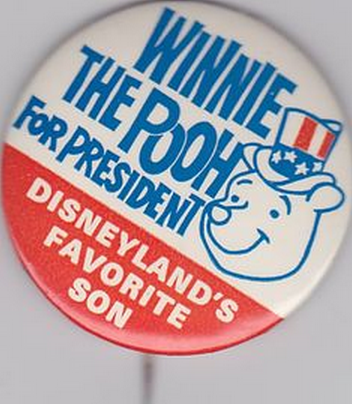 On October 1, 1972, at a convention held at Walt Disney World, Pooh was nominated to run for president on the Children’s Party ticket. 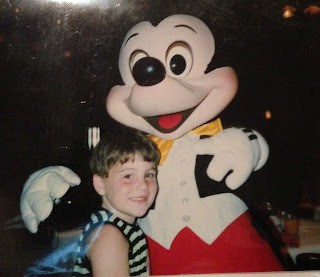 Drawings had been held at Sears, Roebuck and Co. and stores across the nation selected delegates from each of the 50 states to be sent with their families to Walt Disney World. There, they nominated Pooh for president in the forecourt of Cinderella Castle. 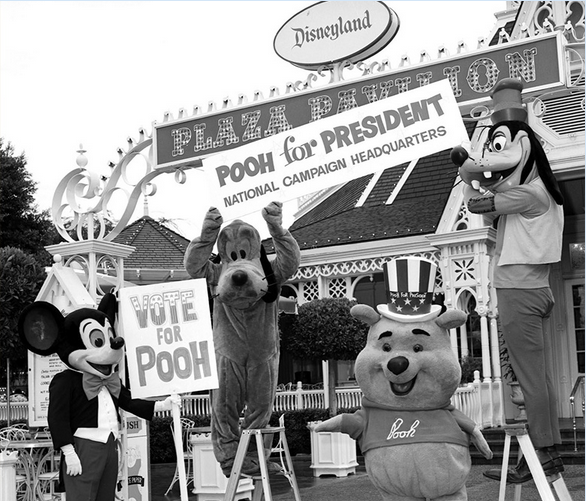 Two days after the Walt Disney World event, from his “West Coast retreat” at Disneyland, Pooh announced his platform and campaign strategy. What message did he have for his constituents? Among Pooh’s policy platforms was a promise to put “hunny in every pot.” According to reports, he also “stressed his battle to ‘lick’ the high price of ice cream cones.” Hot fudge sundaes every Monday and banning spankings rounded out his proposals. With a campaign staff consisting of press secretary Tigger and political advisor Eeyore, Pooh declared that he would soon depart on a whistle-stop train tour of California before opening his national campaign headquarters at Disneyland during a three-day party from October 21 to October 23. At the behest of his press secretary and “close personal friend” Tigger, Pooh unveiled a slate of proposals targeting the youth vote. “If elected in November, I will put two tricycles in every garage, provide free candy on holidays, and make sure everyone enjoys two Saturdays a week,” announced the candidate. Pooh-litical rallies were held up and down the West Coast that month, with marching bands and free balloons, pictures, buttons, and posters for kids. There are no reports noting if this activity was monitored by the Federal Elections Commission. 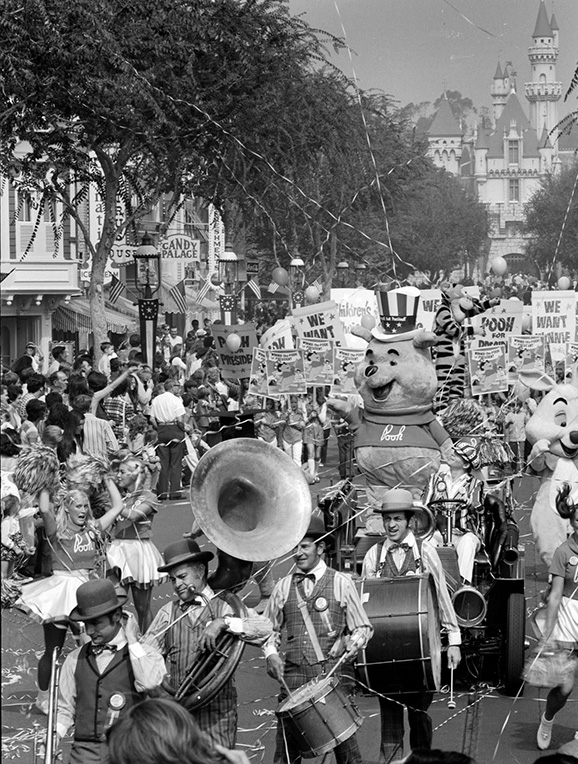 From October 21 to 23, a tickertape Pooh-rade was held daily at Disneyland. Children were asked to gather in front of “it’s a small world” at 11:30 a.m. to join in the parade and political rally. Three times a day, the Pooh Revue was presented on the Tomorrowland Stage, and free showings of Winnie the Pooh and the Blustery Day were held in the Fantasyland Theater. 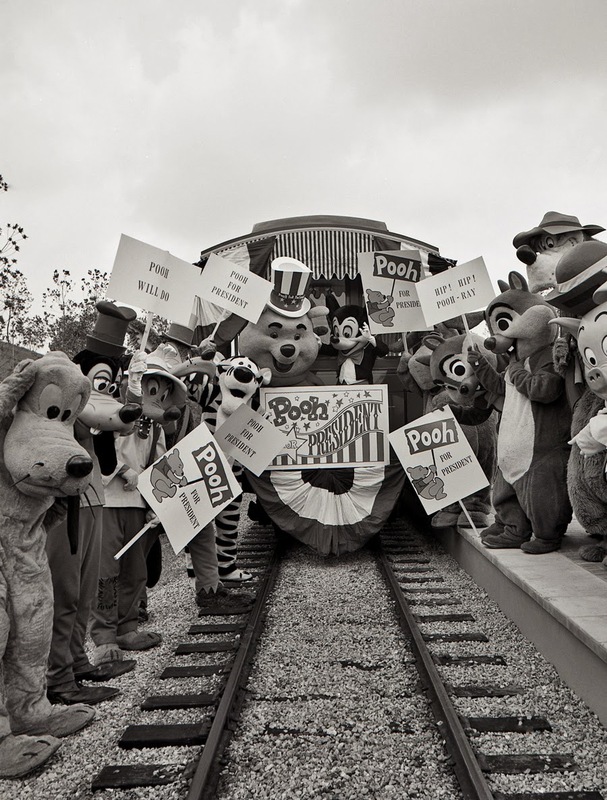 Pooh, Tigger, and Eeyore were available for meet and greets all day at their National Campaign Headquarters in the Carnation Plaza Gardens, and upon departing the park, each child received a free Pooh for President poster, pin, and coloring kit. 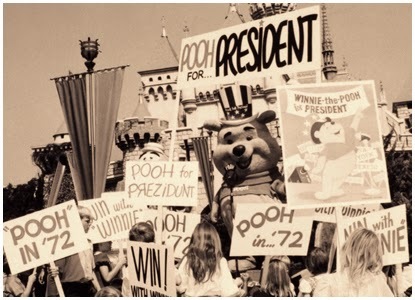 Pooh lost that election in the fall of 1972, polling significantly behind both sitting president Richard Nixon and his Democratic challenger Senator George McGovern. 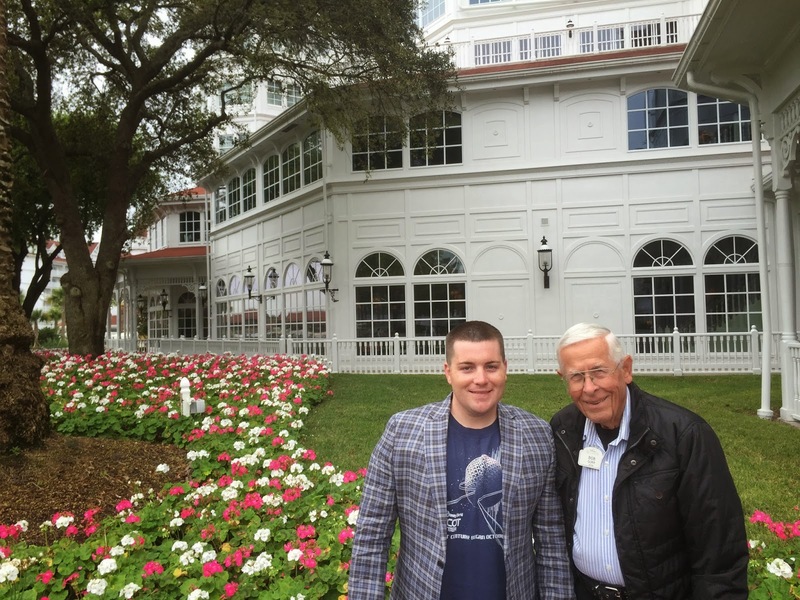 He claimed to withdraw from politics in the years after, but also failed to publicly comment on rumors that he was spotted backstage with Nixon advisor Pat Buchanan when the president gave his infamous “I am not a crook” press conference at Walt Disney World’s Contemporary Resort Hotel in 1973. Pooh ran once again in 1976, and this time he had his own theme song. 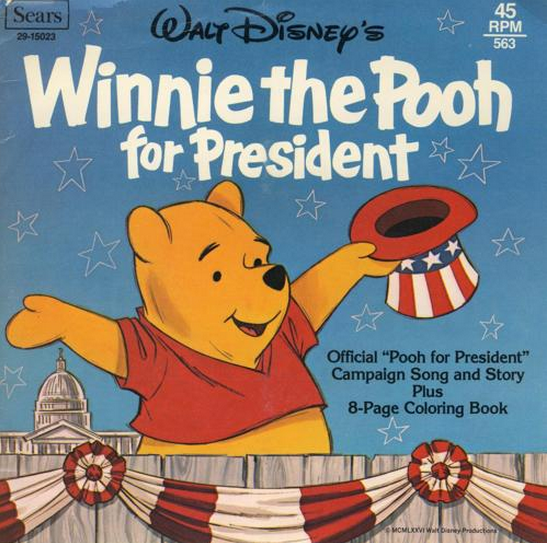 “Winnie the Pooh for President,” written by novelty songwriter Larry Groce, was released as a single and was sold in Sears locations. Once again, Disneyland played host to “Winnie the Pooh for President Days” on October 23 and 24. In addition to the daily Fun Raising rallies and Pooh-litical conventions, a daily Tigger-Tape parade led kids through the park to a rally for The Children’s Pick in ’76 on the steps of Main Street Station. Pooh’s 1976 bid was no more successful than his earlier outings, although his campaign song was nominated for a Grammy for Best Recording for Children. 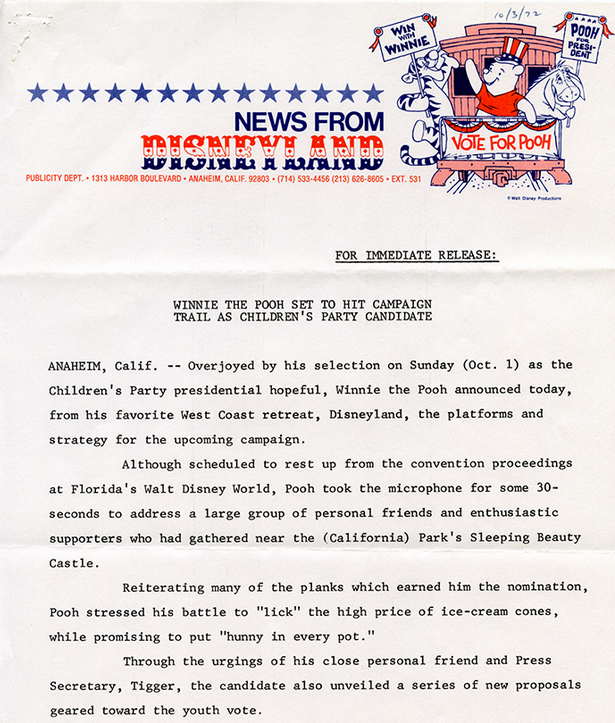 Perhaps this is what gave him the impetus for his final campaign in 1980, when Pooh for President Days were held one last time at Disneyland in October.